* Compass. Depending on your navigation skills, potential navigation needs and budget considerations, you will have to choose between top-shelf compass, cheaper version, or even miniature button compass, but one way or another, you definitely need to pack at least one. * Map/ case. Your profile is number one consideration when selecting maps. While military maps generally provider greater detail and information, in most of sensitive or high risk environments you might be better off with tourist map or even print-out of self-made map. In addition, consider downloading maps on your smartphone. You need pack waterproof case or lamination for your map. No need to go fancy; good Ziploc would do. * Protractor. Make sure you do not pack military protractor for conflict and sensitive areas. You will need the arc (semi-circle would be fine), but no need for long ruler - simple cord/ tread would be enough for you to find directions on map. 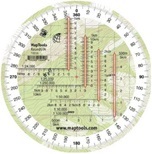 Might be good idea to refresh your map reading tools as well, as using protractor requires refresher practice. Tip: You may choose compass with protractor as an alternative option or for redundancy. - Battery life. When it comes to emergency navigation, nothing’s wrong with simpler functionality or black-and-white screen, if battery lasts longer per charge (and most probably unit costs less too). - Maps is very helpful to have with GPS, especially if you might need to travel into new areas. Consider if maps for the areas of your interest are provided or can be downloaded (and associated cost). ​Alternative or additional GPS capability may be provided through smartphone apps. Apps that assist you with off-line GPS navigation and include maps for areas you might end up in, should be given preference. There are number of good apps that are free such as Maps.me, Map Factor and navmii to name few. ​Some watches also offer GPS functionality.